Exquisite in their designer style, the Royal Palace collection is a beautiful range of ornate and decorative rugs. 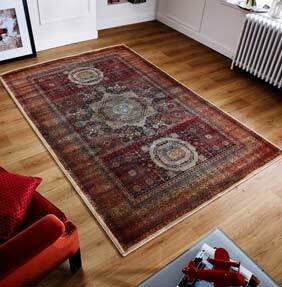 Intricate detailing and ornamental style stands out Each rug will become a centrepiece in any room it calls home and there are a range of elegant patterns to choose from. Each Royal Palace rug has an exceptional two million point pile which allows to the high level of detail. Each rug is woven from an acrylic yarn, chosen for its hardiness and durability. Despite its elegant style, each Royal Palace rug is a hard-wearing choice for the modern home and brings character, elegance and comfort to your space.